Alex Gonzaga had a guest star in her new vlog titled "Sosyal Friend’s House Raid by Alex Gonzaga." This time, she collaborated with her friend Isabelle Daza whom she visited at her house in Makati. "Sa totoo lang di ko alam bakit ko naging kaibigan 'to," she joked in her vlog intro. Alex did a house tour of Isabelle's Makati home showing her living area, dining area and pool area. She also brought Bangus, Chop suey and rice sealed inside ice cream containers, much to the surprise of Isabelle. "Tell me why you made a vlog?," Isabelle asked Alex. "It's really me, I was the one who inspired Alex to vlog. She guested on my video shoot and nag-enjoy siya," Isabelle said. "Alam mo plagiarism ka kinukuha mo 'yung hindi sa'yo. That's plagiarism talaga. Grabe talaga 'yung pag-uugali nito," Alex quipped. 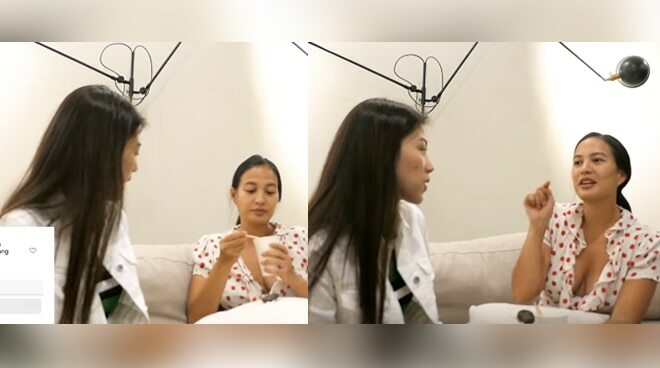 During their conversation, Alex asked Isabelle about an incident before when the latter liked a netizen's comment on Instagram that read, "Gonzaga sisters are cheap." Alex asked the actress, "Alam mo bakit mo nilike 'yung Gonzaga sisters are cheap'? Kaya nagka-issue tuloy. Tawa-tawa ka pa diyan eh. Cheap, ikaw nga pinakain mo sa akin, at least ako may bangus sa'yo tsaka Chop suey, ikaw taho 'yung pinakain mo sa akin." Isabelle explained, "Nila-like ko kasi lahat ng comments. When I'm like waiting in line, I'll go on my comments, I'll heart, heart, heart. Hindi ko binabasa." "Anyway, Tin mabait 'to. Mag-shout out ka sa ate. Kausapin mo na si Tin, nanonood 'yan si Tin sa YouTube dalian mo," Alex said. The vlog already garnered more than a million views as of this writing.